You've done your research and found yourself a house, a new dentist, a vet, and the closest pharmacy. Now you're settled in and faced with the hardest part of moving to a new community -- making friends. This may be your first move or your 10th, but regardless of how many times you've been through it, it never really gets easier. We promise there is a new best mate out there for you, and here is your guide to help you find each other. Get on social media. Gone are the days of actually having to go somewhere to meet and interact with someone. Now, thanks to multiple social media platforms, you can scroll and search using keywords that match your own interests to find someone local to hang out with. That doesn't mean it isn't fool proof, and it certainly doesn't make it any easier for the more introverted types to put themselves out there. 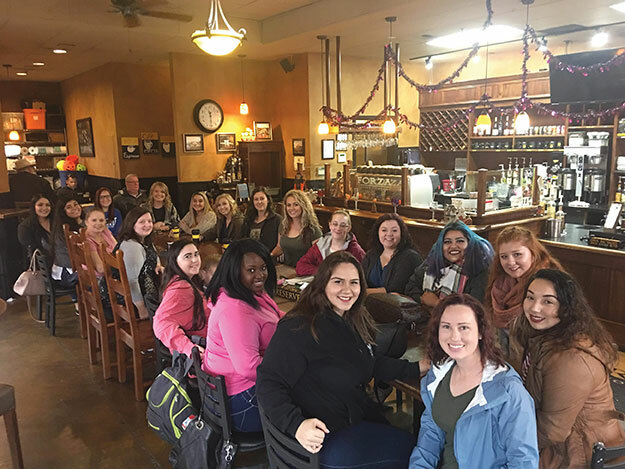 Luckily, some sweet and gentle souls recognized the need for a social media group specifically designed to bring female military-affiliated individuals together for fun and bonding. The ladies behind JBLM Ladies Meetup on Facebook organize and post about fun events regularly, sometimes multiple events going on every week. Whether you are looking for another mom to hang out with or some wild gals to go dancing with, you're sure to find your new BFF at one of these many fun meet-ups. If you aren't female, or are looking for friends that share more specific common interests, check out JBLM Scuba Club, Travelers from JBLM, JBLM Walk Group, Bad Moms of JBLM, JBLM Spouse Network, JBLM-Lewis Zumba, and Beauties of JBLM. There are also many neighborhood pages on Facebook that make it very easy to introduce you to the community. Hit the gym. Multitask by getting in shape and meeting new people at the same time. There are many gyms to choose from on JBLM depending on the type of workout you are looking for, although the majority of them have a combination of weight-lifting options and cardio machines. If striking up a conversation with your neighboring treadmill feels a little awkward, then drop in on one of the many free group exercise classes offered at Jensen Family Health and Fitness Center, McChord Annex Sports and Fitness Center, Wilson Sports and Fitness Center and McVeigh Sports and Fitness Center. Choose from Zumba, Cycling, MixedFit, Yoga, Kickboxing and many more. Volunteer with your Family Readiness Group. Your company FRG is a great way to get involved with your organization and meet other family members. This is especially important if you are a new spouse or your servicemember is getting ready to deploy. The FRG is set up to help support family members with information and resources, and ultimately maintain readiness and communication. There are multiple volunteer positions available depending on the amount of time you have to give. A great perk to volunteering with your FRG is being able to spend time with other family members who are experiencing many of the same military-related struggles as you, as well as having the same training and deployment dates. This means the friends you make through the FRG are also separated from their soldiers at the same time. Slumber party, anyone? Go on an adventure. The MWR offers an exciting assortment of classes and trips through Leisure Activities and the Northwest Adventure Center. This is a guaranteed friend maker with built-in shared interests. Classes and trips range from very adventurous like Scuba diving, bungee jumping, rock climbing and mountain biking, to more leisure activities including trips to Leavenworth, photography classes, whale watching and wine tours. There are many options to choose from for all skills and interests, and a guaranteed good time. Making friends can sometimes take a while, especially as an adult, but if you continue to put yourself out there, it will happen. All you need is just one good friend, and if you can accomplish that, your time here at JBLM will be an enjoyable and memorable one.